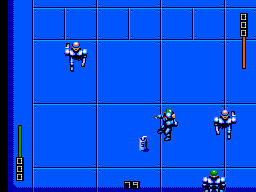 Speedball 2, as stories go, is a bit lacking but there aren’t many futuristic "throw a steel ball at your opponent's face" sport games around and so what does the story matter? The minimal plot reads as such: It’s the future, a brutal sport called Speedball has been dragged up from the underground scene and organised. You take a team of beginners and forge them into warriors who can destroy any opposition in pursuit of goals, points, money and blood. Your job is to take control of a fledgling Speedball team and then take them to the top. There is the choice of being the manager and guiding the team's structure while not actually having any control over what happens on the field, or doing both. Or, it's possible to even take to the arena with a friend in the two-player mode. The action takes place in an arena full of power ups and objects, all viewed from overhead and your main objective is to win by gaining more points than your opponents by scoring goals and using the point accumulators. Take the steel ball and throw it hard and fast, be violent and you’ll win. Your team, who are always Brutal Deluxe, start at the bottom of Division 2 going into a new season. The team is assembled, there’s limited money in the bank and your first game is around the corner. The team follows a pretty standard structure of Forwards, Midfielders, Defenders, a Goalkeeper and substitutes. There are 10 players per team on the pitch at one time; the goalie and three from each field position. You control the player on your team who's in possession of the ball or whomever is nearest the ball should an opponent have it or it be loose in the arena. Don’t like a player on your team? Exchange him plus a fee for another team’s player on the Transfer Market. Don’t like a player on the other team? Beat him to a pulp and watch as a robot drags him out of the arena for a less experienced sub to replace him. Despite the simplistic premise, the game certainly has character. Around the rectangular arena are various items for players or opponent to collect to increase the chances of winning. You’ll spend a lot of time throwing the ball at the walls where you can find such things as a sphere that will electrify the ball, devices that multiplies further points, and warps. These devices all contribute to the strategy side of play and give Speedball 2 some added depth. Also appearing within the arena is money for either team to collect to use between games to boost player attributes or to buy star players on the Transfer Market. There are several attributes for the players to increase such as power, defence, intelligence and speed. Money can raise these stats or power-ups can be found on the arena floor, so you’ll have to balance gameplay between getting money and earning points during a game. There’s a lot to think about and do, on and off the field of play. 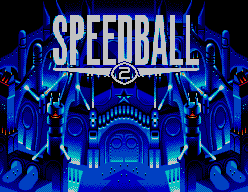 Speedball 2 can be very simple or complicated depending on how much you want to get out of it. There are tons of options during the management side of the game, but they can be bypassed if you want to get straight to the mauling. Do that, however, and you won’t win too often. You’ll need to spend wisely and play hard to get promoted to Division 1. There are plenty of options to help you get used to the game, from taking just the role of the manager and watching the actual game to practicing in an empty arena with infinite time to throw, tackle and run your players into the ground. Going straight into a game will be fun but figuring out strategies is a trial & error process. Play a single game, practice, act solely as the manager, play in the League or enter the Knockout tournament. This game has the potential to last a while. The graphics are excellent, everything in the game appears very refined and sharp, although they are very...well, blue. 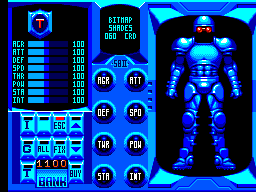 Nearly everything is a greyish blue, from the arena floor and wall to the player’s sprites and the Team Management interface. Sure it fits into the futuristic sports theme but a bit more colour wouldn’t have been a bad thing. The only way to identify your team is by the small coloured arc above their heads, you have green, the opponent has orange, but other than that the sprites are the same. There is no radar to tell where everyone is off screen but looking at it every few seconds would be suicidal. A lot of the time you’ll throw the ball blindly and hope you have a team mate waiting off screen to grab it which can be annoying if there’s no one to catch it but there is sadly no way around this with just an overhead view of the arena. With that said, however, the game is incredibly smooth with no graphical glitches or slowdown. Overall this is among the game's best aspects, it's very polished and there are little touches thoughout to be appreciated. The sound is minimal to say the least. At the title screen a fitting tune plays, at the end of a game one of two ditties will play depending on whether you won or lost and that’s about it for music. Luckily the effects during actual play almost make up for it. The roar of the crowd is nice but not in any way realistic. The sound of one team member tackling an opponent is effective and the various methods of gaining points all with their own individual "pinball" sound do contribute to the atmosphere. The controls are great. While on the field of play you need only run around and use one button for everything (throwing, jumping to grab the ball, tackling) and they're never less than responsive. Buttons 1 and 2 share the same function during games, during the management areas of the game they have separate functions but it's all easy to understand. What little there is to the controls is handled flawlessly so they receive high marks. With all of the modes of play mentioned above, a challenge which allows you to improve on with every go and a fun two-player mode, there's a lot of replay value to be had here. Division 2 isn't a walkover but it does require some skill, then should you gain a promotion there's the extremely difficult Division 1 to keep you occupied. One downfall that might see players getting bored and not returning very often to the game is the fact that there's only one team to control. The ability to choose from the teams featured as opponents in the game would have greatly increased both the gameplay and replay value. Speedball 2 is a well-made and challenging game that can be frustrating at times but is very rewarding in the long run. Winning games is very satifying, it balances the management and action aspects of the game very well, and more importantly it's fun.